6.Compatibility for Android, Windows system. 9.Switch 3: Windows tablet,Android mobile charging and OTG work mode. 10.Note:Some models used for the first time, there is no charge with OTG function, restart the tablet at a time. If you use OTG function without connecting power supply, you can switch to 1. Switch 3,Connect the external power supply:Samsung Galaxy S3,Samsung Galaxy S4,Samsung Galaxy NOTE2,Samsung Galaxy NOTE3. Tips: If you need different length OTG and Card Reader adapter cable , you can search " Cerrxian OTG"," Lemeng OTG","Cerrxian Card Reader" and "Lemeng Card Reader ".There are so many different types there will be one that you will find amazing. 2 x USB-A 2.0 Female ports + 2 x card slots (SD, TF) + Micro USB Female port + Micro USB Male plug adapter cable with switch and a USB-A Male to Micro USB Female adapter allow mobile users to access to media daily life. Support 2x USB2.0 HUB at the same time such as U disk, mouse,keyboard, game handle and etc. Support SD card, Micro-SD Card (TF). Support OTG and charging function and Hot Plug. 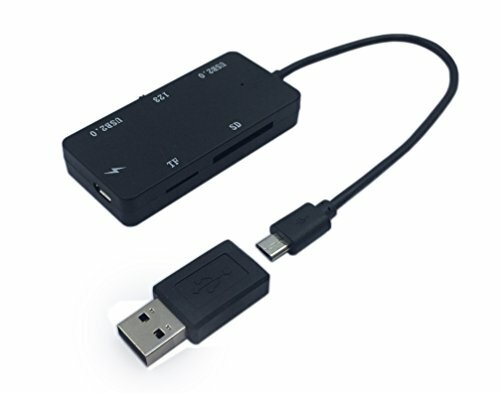 Connect the USB male to Micro USB female adapter, can be used as a PC USB HUB + Card Reader. If you have any questions about this product by CERRXIAN, contact us by completing and submitting the form below. If you are looking for a specif part number, please include it with your message.